My husband is home! 🙂 He just got back from a seven month deployment, and my son and I are absolutely thrilled to have him finally home. However, this introduces a new challenge to my weight loss journey. The short answer is portion control. 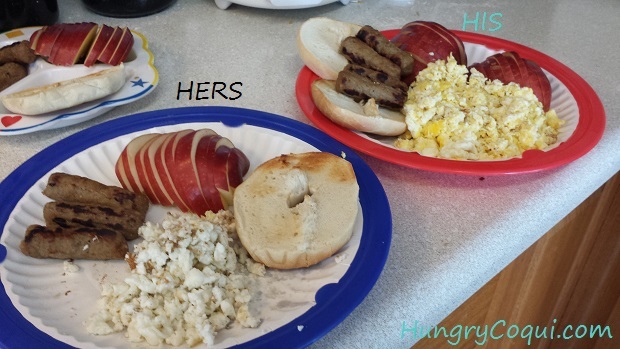 His plate has 4 whole eggs, while mine only has about 3 egg whites. I took only half each of an apple and a bagel, while he ate each one whole. All told, my plate amounted to about 400 calories, while his was well over 700. For lunch and dinner his plate is often loaded up with extra protein and carbs, while mine is half-filled with veggies. We both make it a point to stay very well-hydrated. We have decided to start planning our daily meals ahead to better track our intake and grocery needs. I’m now cooking enough for 4 people, even though I’m only feeding 2 adults and a toddler. The most important thing is choosing healthy and whole foods. So, if you’re trying to figure out how to balance several people with different dietary goals on only 1 grocery budget, rest assured that it CAN be done. I’ll be revisiting this topics in a few weeks to let you know how each of us are progressing. Wish us luck! Next post: Geek Pride Day: Hungry Coqui’s First Giveaway!